A major concern that teachers, parents, librarians, and school administrators have whenever their students search for information on the Internet is having the students stumble across inappropriate materials. One way to alleviate that fear is to create your own search engine using Google Custom Search, but that could become very time-consuming. Another option is to have students use search engines intended for academic and or child use. Here are seven search engines for students of all ages. Sweet Search is a search engine that searches only the sites that have been reviewed and approved by a team of librarians, teachers, and research experts. In all there are 35,000 websites that have been reviewed and approved by Sweet Search. In addition to the general search engine, Sweet Search offers five niche search engines. The niche search engines are for Social Studies, Biographies, SweetSites (organized by grade and subject area), School Librarians, and Sweet Search 4 Me (for elementary school students). KidRex is a new kid-safe search engine powered by Google custom search. KidRex uses a combination of Google's safe search mode and their own database of filtered keywords, phrases, and websites. In the event that a questionable website does get past the filters, KidRex has a site removal request form. Ref Seek is a search engine designed for academic use. Ref Seek seems to eliminate the advertising and paid links found on Google, Ask, Yahoo, and other commercial search engines. Ref Seek's intention is to serve only search results that are academic in nature. The difference between Ref Seek and a generic Google search lies lower than the top results in search returns. As you compare search results between Ref Seek and Google you will find that the second and third pages of search results on Ref Seek contain results that seem to be more "academic" than what is found on the second and third pages of a generic Google search. 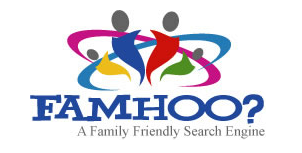 Famhoo is another option for kid friendly searches. Famhoo draws on the collective results of the major search mainstream search engines like Google, AOL, and Yahoo. Famhoo simply provides a stricter family filter than the filters available on mainstream search engines. Ask Kids is the kid friendly, kid safe version of the popular search engine Ask.com. Ask Kids is divided into five categories of which one is a general search option. The five categories are School House, movies, games, images, and video. The School House category provides students with suggested topics and links to resources for those topics. The School House also serves as a general search tool. In the other search categories Ask Kids makes suggestions for search refinement. A great aspect of the search results that Ask Kids provides is the option to refine searches based on a student's age. Thanks to Joy Kirr for pointing out that this resource is no longer online. Wolfram Alpha is billed as a computational search engine and this is exactly what it does. If students have any questions involving numbers, Wolfram Alpha is the place to go. Wolfram Alpha can be used for other searches, but it's not nearly as useful for general inquiries as it is for computational questions. Google Scholar is one of Google's lesser-known tools. Google Scholar is a search engine designed to search scholarly journals, Supreme Court records, and patent records. In some cases the results will link to abstracts of books and articles that you will then have to obtain from a library or book retailer. In other cases results will link to fully viewable documents.